Today is Entrecard's first official Top Dropper Day. It's a nice way to say thanks to some regular visitors to my blog, so I thought I'd play along. 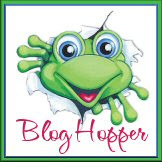 Here's a little linky love for my top ten droppers for the month of January. Thanks for stopping by! First, The Apron Goddesses are giving away a Sweetheart of an apron from Carolyn's Kitchen. There are some smokin' aprons available at Carolyn's Kitchen. Carolyn West's vintage-inspired aprons and dish gloves are for the "Suzy Homefaker" in all of us! 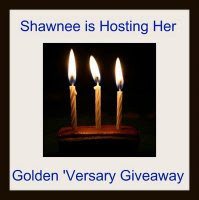 Check out the giveaway by clicking here. If you loved what you saw at Carolyn's Kitchen, double your chances of winning an apron from there by also heading over to A Wrestling Addicted Mommy's giveaway. She's giving a black Sweetheart apron away from Carolyn's. And supposing you just can't get enough of Carolyn's Kitchen, stop by A List Baby and enter to win a pink Sweetheart apron! (This one is closing really soon, though!) Sorry, this one is closed now, but I managed to round up a couple more giveaways at the bottom of this post! And now for something completely different! Well, not completely... It's still an apron giveaway, but this time featuring Jessie Steele aprons. As part of "Mom Time in '09," Go Graham Go is giving away a vintage inspired apron from Jessie Steele. With matching oven mitts and tea towels, you can reign supreme as kitchen diva! Gosh, these are real beauties--hard to pick a favorite! Don't miss this giveaway! I'm thinking I entered another Jessie Steele contest the other day, so I will try to see if I can find it around again and post it here later. Want to get these out here now because the A List Baby giveaway is only good until noon central today. Wish I could have given a heads-up sooner! And yes, obviously, someone needs to keep me away from Joann's 99 cent pattern sales! I just keep buying patterns with the optimistic viewpoint that someday I will have time to sew. But honestly, I'm going to need multiple lifetimes to complete all the patterns and projects I have acquired and keep acquiring! Well, I didn't manage to find the other Jessie Steele giveaway I had in mind. (I'm thinking it was probably over anyhow.) But I managed to find a bunch of others. So enjoy! 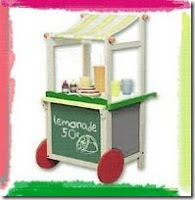 Bella Casa News is hosting an apron giveaway. Be sure to take a look because this one comes with candy (and a few other goodies)!! Click here for the apron giveaway post. Nicole from Precious Pink Designs is offering any apron from her Etsy shop, Desserts and Skirts, to the winner of her giveaway. I'm loving the pink and blue one myself. She promises they will stand up to plenty of machine washings that would be required by messy cooks like myself! Family Traditions is giving away a cookbook and apron set. The cookbook looks like it would be a fun one with recipes from storytellers. Enter this giveaway here. And finally, if one apron is good, then two must be better! So how about a mother and daughter apron set? 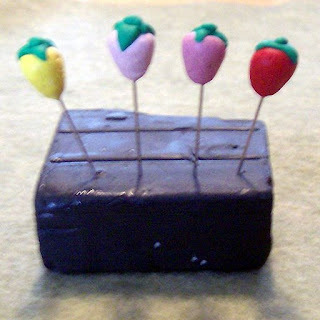 Get your little cuties in the kitchen with you and make something yummy! Pennyraine.com is offering this darling set from jumpinbloomers.com. So, that's a lot of aprons! I'd just like to offer thanks to all the great bloggers giving away all these aprons. Hopefully I'll be able to tie one on soon! I was sorting some of Finn's drawers the other day and pulled out a whole pile of receiving blankets. I figured that I'm not using them anymore, but the fabric is still just fine on them. I've been meaning to make some un-paper towels for the kitchen, so I thought to myself, this would be perfect for making them. (I had planned to use some of my flannel stash for this, but now I can hoard that a bit longer!) Since they are already finished around the edges, I just pressed them and used the creases as a guide to serge along. I used three flannel blankets and wound up with a dozen cloths--making four cloths from each blanket. My family goes through paper towels at an alarming rate when we have them. I actually haven't bought any the last couple shopping trips, and nobody has even mentioned that the paper towel holder is empty. But if I put a roll of towels up, they'd be gone in no time! So I'm going to stick these in a basket in the kitchen, and introduce my family to our new un-paper towels! No, I'm not going anywhere. That's just my message to anyone that knows me locally. I thought things were clearing up here on our hill, but we got some more snow last night, and we are under a storm warning for several more inches of snow. I did manage to get out last week on Friday with Paul's car, but today Paul managed to find an inconvenient parking spot for his car and we are now stuck on the hill. Even my dad's truck is stuck up here because he didn't want to risk trying to get around Paul's vehicle. So I'm staying here until the spring when things will hopefully be well thawed!! Ready to see what happened today when he tried to go to town? It's not actually very much snow, but that snow is just the right consistency that it's packing right down to ice. I barely stayed on my feet when I went up to close up the chicken coop this evening. It could have been worse, though. He could have been hurt. Or he could have slide the other direction into the pond. The hood is banged up, and a headlight is busted out. One fender is much worse for the wear. Please let Spring hurry up! I haven't posted my "Make Something Monday" yet, either. I do have a project in mind and if I could get into the sewing room for just a little while, I could whip it out quickly enough. I'm going to try my best to get it done this evening. So I may manage to post it a bit later! Until our driveway melts, I'm stuck at home. I haven't had my car down off our hill in over a week because of snow and what not. I'm hoping things might melt enough today, because it's supposed to get up around 40F. 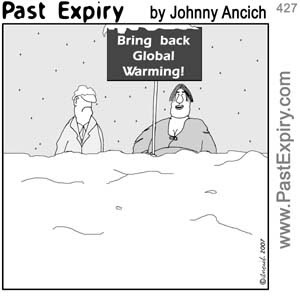 But if not today, tomorrow is supposed to be around 50F. I could most probably get the car out of the driveway (by sliding down the icy part straight towards the road--a little harrowing) but I probably couldn't make it back up again. And the thought of carrying Holly and groceries back up is something I'm not tackling. My husband has been making it up and down the driveway in his vehicle which is 4WD, but after being laid off for several weeks, he has been back to work again this week. Figures it would coincide with the first time I've really been stuck in the house for the winter. He did bring home milk and toilet paper last night, so we're not without the necessities. And staying in does keep the budget in check! Our furnace isn't quite keeping up with this cold snap we've been having. We normally don't spend this much time with really cold weather. Plus we've been fortunate enough to be able to add onto our house, but that means the furnace is trying to keep up with heating a larger area. We'll have to make adding another furnace a priority before next winter because we've got a living room addition framed onto the house right now that would really tax our heating system if nothing was done to it. So, I've been baking something every day just to give the house a little extra warmth. Yesterday I made some maple blond brownies and if I could remember where I found the recipe, I'd be happy to give credit here, but I can't remember! Sorry, but if anybody recognizes it, feel free to claim it and I'll give credit where credit is due. As I was saying, I made these brownies/blondies, and my husband couldn't get enough of them. He seriously wanted me to make another pan last night. The bad thing about them is how much maple syrup they use, but I do like that it uses maple instead of sugar. Unfortunately, they used up about half of my jar of maple syrup which is over $7.00 at the store. So they aren't the cheapest baked treat to make, but I got the feeling that if I told my hubby that I needed to budget half the grocery allowance for maple syrup to make these goodies on a daily basis, he would be fine with that! Butter and lightly flour a 13"x9" pan. Beat butter and syrup in a large bowl. I also added some walnuts into this because I thought it seemed like it needed nuts! My hubby agreed that the nuts were an important ingredient. And here's something else that has made me feel warm and toasty! I've received two rewards in the last week or two! Thanks so much to Mary at Mother No's Best and Michelle at The Giving Tree Project 2009. 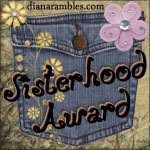 From Mary, I received the Sisterhood Award which was created by Diana of Diana Rambles (another daily read of mine.) It was inspired by the Sisterhood of the Traveling Pants. I love both those movies and just recently watched the second with my own sister. Mary is a kind blogger with multiple talents, and I love peeking in over at her blog to look at her crochet projects and other things she has crafted. She also posts interesting tips and tidbits she digs up. She's looking for a job now, but I hope when she's back to work she is able to keep entertaining us with her blog! And from Michelle, I received the "You've Been Tagged" award. I've been following Michelle's year of giving since I stumbled on her blog via another blogger who received a special gift from Michelle. Inspired by The Giving Tree book by Shel Silverstein, Michelle has decided to make an effort every day to find some way to give. I loved this book when I was a kid, and it's still a sentimental heart-breaker. I've been avidly following along with her giving journey and am so glad to have found it so close to it's inception so I can watch the whole thing unfold. 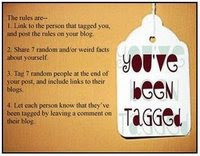 I'm supposed to list seven weird or random things about myself, but I'm going to leave that for this weekend, hopefully. So thanks to Mary and Michelle who both warmed my heart with these awards! Be sure to check both of their blogs out, you won't be sorry! This week, I had my daughter, Ivy, make something for me that turned out so cute I decided to post it for "Make Something Monday". 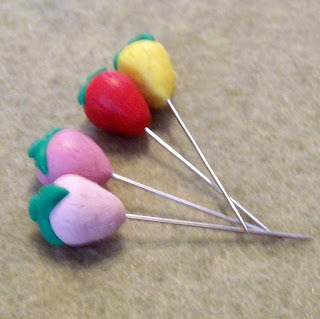 She loves using her polymer clay and I had seen some really cute pins with polymer clay decorations on the ends. So I showed her the pictures and she said she could do it. I think she did a great job. I just love the strawberries. She 's working on some blueberry sets now. Meet Cowboy who has come over to play with our girls! We are borrowing him from some kind folks who live nearby. 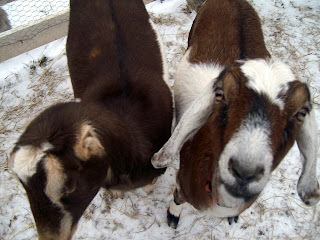 The plan is to have babies here early this summer because we are going to be milking our goats. 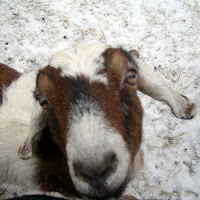 It's been rather funny watching the goatie introductions. 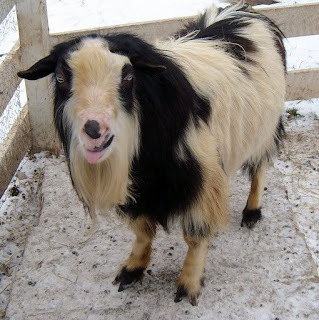 Male goats aren't the most suave creatures. His form of greeting involves curling his lip and blowing raspberries at the girls. He also likes to lick them in places that we won't mention. They spend their time dashing away from him and looking at me as if to say, What have you done to us? 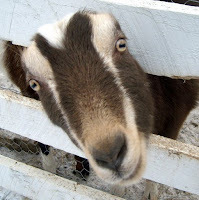 Now let me say, everything you hear about goats and smell is thanks to boy goaties! Whew...he has an aroma--to put it nicely! Our girls don't smell at all. 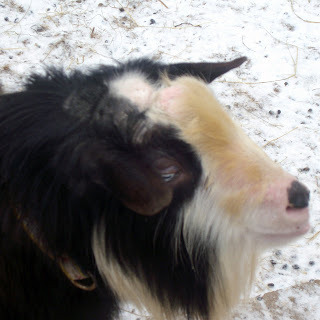 That's one reason if you only have a couple goats, you don't bother getting a boy goat. They smell and you have to pen them up far away from the ladies or the smell can taint the milk when you are milking them. So Cowboy is "visiting" our girls for the next several weeks to give them plenty of time to make acquaintances. Maybe the girls will forgive me... Look at their faces. On the other hand, who could resist this? Notice the tongue hanging out? "Wait! Where are you going? What do you mean he's staying?" I made this little wallet from a tutorial on Craftster. It's called the Easy Peasy Snap wallet, and it really is easy to make! It took me longer to find the interfacing in my sewing room, I think! Plus this uses such a little bit of fabric, it would be great for using up scraps. It measures about 3x5 inches. So it's small, but could be used to hold gift cards or little treasures.